I am glad I waited to write the post until this morning. We received 1 and 3/10th inches of rain yesterday afternoon. We were also fortunate to receive 15/100ths last Friday. The plants are all sighing a huge relief and so are we. We had started a regular routine of irrigation last week, but nothing satisfies the needs of a plant like Mother Nature. There just isn’t a substitute. So with the moisture, humidity, heat and warm nights, the plants will have some significant development. I am also hopeful to see growth from the spinach, carrots, peas, Dragon Tongue beans and lettuce varieties that we planted the week of June 24. The boys found a red tomato. Hopeful that all of the green tomatoes will start ripening. Salad Blend includes: Simpson Elite Lettuce, Prizehead Lettuce, Red Oak Leaf Lettuce, Beet Leaves and Spinach – Wash, cut off longer stems. 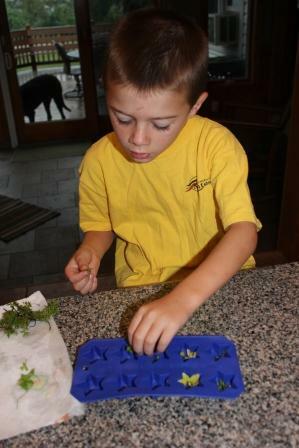 Peas – The pods are edible so enjoy eating them out of the pod or the pod and all. This is the last harvest until the ones planted the week of June 24 begin to grow. This rain will help!! 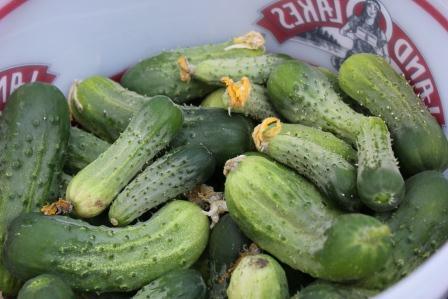 Cucumbers – We had a lot ready to be picked over the weekend. 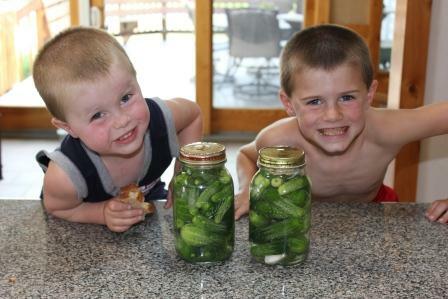 We picked them and made some sunshine pickles. SEE RECIPE BELOW. 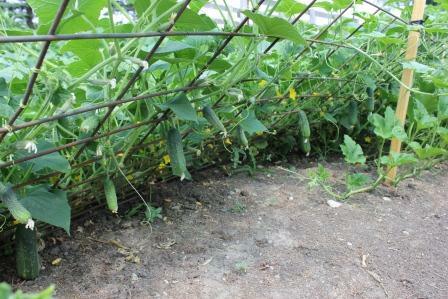 Cucumbers climbing up and hanging down through the fence. This helps keep the soil off of them keeping them cleaner and also helps to prevent soil borne issues with the cucumber. Broccoli – A new variety. We started these from seed mid-March using clear peanut butter jars with holes drilled in the top. This was by far our best starter greenhouse this year. Green Beans – A good healthy harvest this week. Chioggia Beets – Beautiful red bulbs with a few white bulbs in the mix. 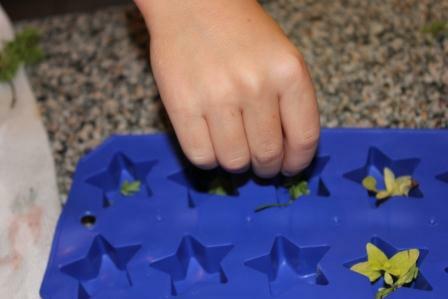 Potatoes – Varieties included are red (Norland – great for mashed or boiled potatoes), Kennebec (baking – brown skin) and blue potatoes (love mashing them … a lot of fun with kids and makes a colorful plate). The US Potato Board has some good information and recipes. Tomatoes – We have a lot of green tomatoes on the vine a few cherry tomatoes have turned. I am hopeful for some next week. 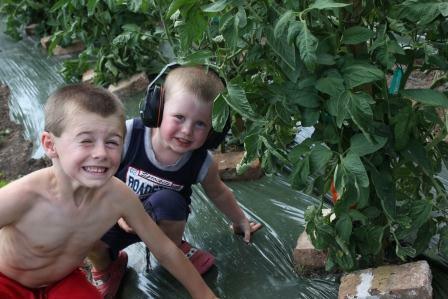 Peppers – A few varieties were ready this week – green and banana peppers. 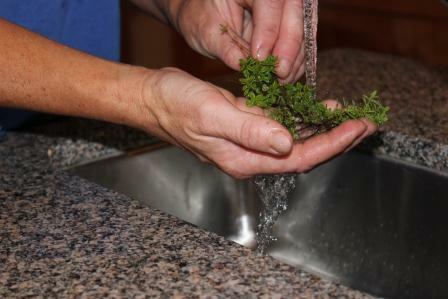 Herbs – Red Rubin basil, mint, parsley, orange thyme and lemon thyme Remember you can dry them or you can freeze in an ice-cube to use later. SEE PHOTO STORY BELOW TO WALK YOU THROUGH THIS. Fresh cut arrangement – Zinnias, hosta leaves, Rudbeckia, sunflowers to name a few. 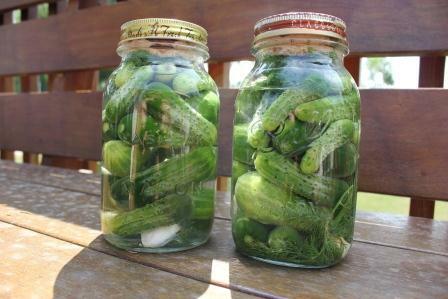 Recipe for pickling cucumbers, asparagus and green beans. 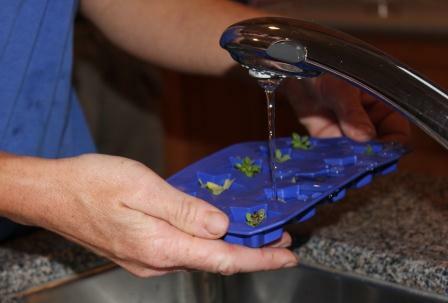 *Get a large glass container with a screw on lid or canning jar lid and ring. The recipe is for one gallon jar. (Size up/down for your jar size.) The gallon recipe is listed below the pictures. The recipe listed in the pictures is for 2 quart jars which is 1/2 the recipe. Editor’s Note: Because I felt this would take up less room and this was our first time trying the recipe. 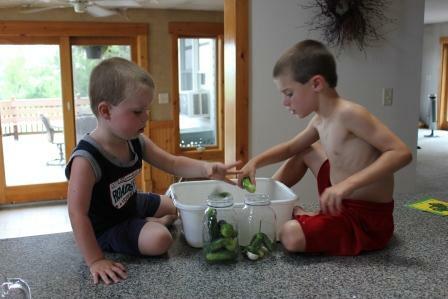 First, we picked the cucumbers. Note the flowers on the cucumbers. The flowers are what produce the parts of the plant that we eat. Sure glad the bees have been busy pollinating! Always remember to wash your fruits and vegetables. I washed the cucumbers under cold water to remove the flowers, dirt and little prickles. 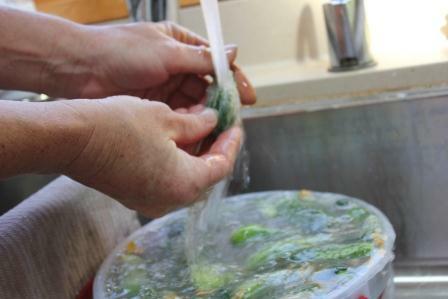 Next we made the brine. We made half of the recipe below so the half recipe is listed in the pictures. This is what we did. 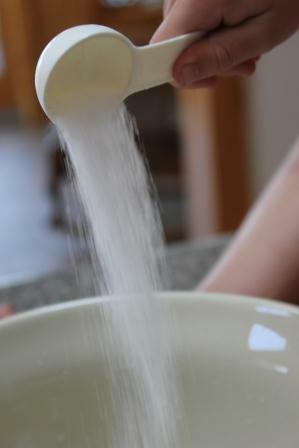 In a separate bowl where we combined and stirred together: 3 cups cold water, 3/4 cup white vinegar and 3 Tablespoons of Kosher salt (a substitute for canning salt). 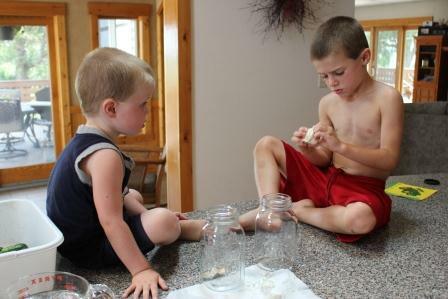 Next we added to the bottom of each quart jar: *Put 1-2 cloves of garlic and 1-2 heads of dill on the bottom of the jar. Keith had fun separating out the cloves of garlic. 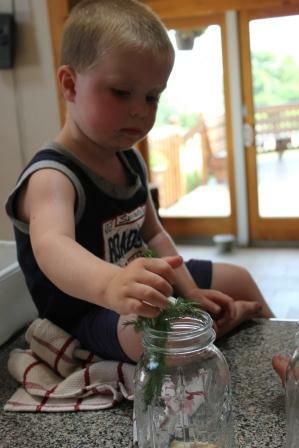 Sam placed 1 – 2 heads of dill in each quart jar. 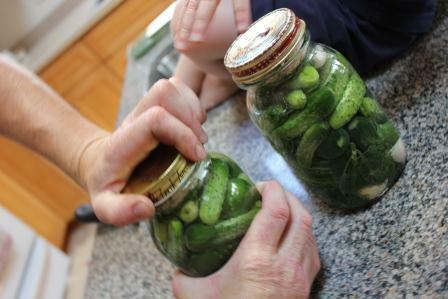 Next we filled and packed the jars full of smaller cucumbers. 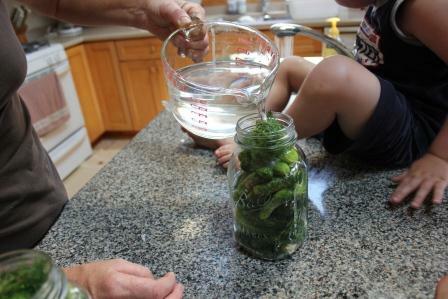 After placing 1 garlic clove and 1 heads of dill in each jar on top of the vegetables, we poured our brine into each jar. Covered each jar with a piece of rye bread. I couldn’t find rye only bread at the store so I looked for bread made with rye flour as part of the ingredients. Wipe the top of the jars with a clean cloth and then tighten the lids. I did run the jars and lids through the dishwasher prior to doing this project to ensure they were as sanitary as possible. Two boys excited to see how this recipe will turn out and proud of what they have helped to make. Set in the sun for 3 days and 3 nights. If you have a gloomy or cloudy day you may want to add another day. Then bring the jar in and take out the rye bread and dill and garlic on the top of the jar. Refrigerate and enjoy. The result was a success. Steve and Keith who are the pickle consumers in the family loved them! 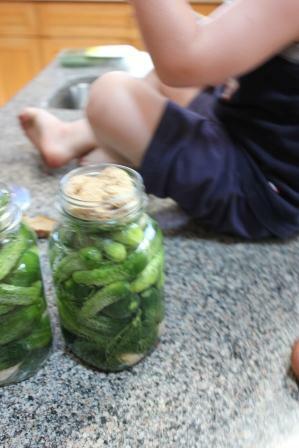 A few of the pickles bleached white in the sun, but they said the were delicious. *Put 2-6 cloves of garlic and 3-4 heads of dill on the bottom of the jar. 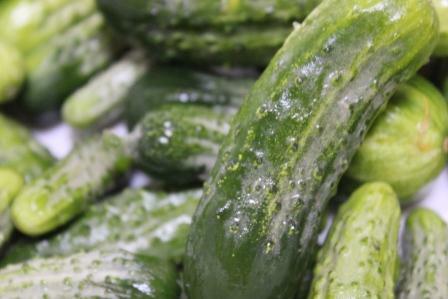 *Fill with cucumbers, asparagus or green beans. *Put 2-4 garlic cloves and 2 heads of dill on the top of the vegetables. *Cover all ingredients with the brine. *Then put one slice of rye bread on the top of everything. *Put the cover on and set in the sun for 3 days and 3 nights. If you have a gloomy or cloudy day you may want to add another day. Then bring the jar in and take out the rye bread and dill and garlic on the top of the jar. Refrigerate. Ready to eat!! Very crispy and yummy! Always keep in the fridge. You do not can these. This entry was posted in Uncategorized and tagged CSA, factory farms, family farms, Gardening, Northfield, pickles, sunshine pickles, vegetables. Bookmark the permalink. 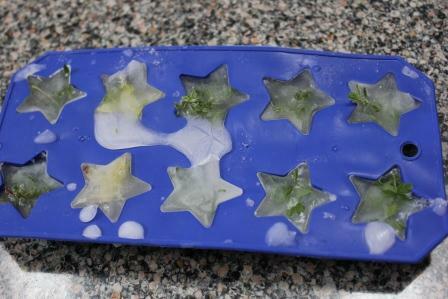 Fun idea with the ice cubes! Thanks Tammy and the boys really liked seeing them in the ice cubes. It was fun!